THIS SECTION IS FOR EMPLOYEES ONLY. EMPLOYERS MAY NOT ASSIST EMPLOYEES IN THEIR EFFORTS TO KICK A UNION OUT OF THE WORKPLACE. In order to start the process of decertifying a union, you must have enough employees interested in doing so. In other words, do a large majority of employees want to kick the union out or just a few? In order to be successful in kicking the union out of your worklife, you need to have a majority of your co-workers committed to doing so. STEP TWO: IS THE TIMING RIGHT? 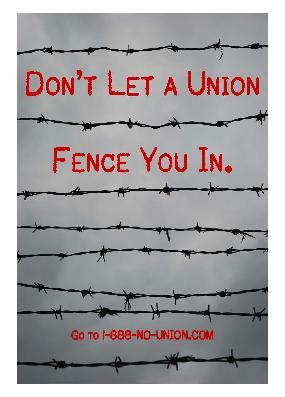 If you have been newly unionized, you may not decertify the union for at least one year following certification. However, if you have been unionized for some time, you can decertify the union near the expiration of your current contract. The National Labor Relations Board will usually only process a decertification petition during a 30-day window near the end of the contract. This 30-day window opens up 90 days prior to the contract expiration and closes again 60 days prior to the contract expiration, EXCEPT for health care workers. Health care workers' 30-day window opens up 120 days prior to the contract expiration and closes 90 days prior to the contract expiration. If you missed the 30-day window, you CAN file a decertification petition AFTER the contract expires as long as there has NOT been another contract negotiated to replace it. While there is a minimum requirement of having 30% of employee signatures, you should know that you will need a majority (at least 50%) of your co-workers to VOTE to decertify the union. As the union will typically fight your efforts to decertify it, it is advisable to have a large majority committed to kicking the union out before you begin the process of gathering signatures. Once you have established that your co-workers desire decertification, you begin gathering signatures. Once you have gathered enough signatures to file your decertification petition with the National Labor Relations Board, download the NLRB's form (here) and file it with the appropriate NLRB Regional Office (go here to locate the nearest NLRB office). Delay Tactics � Unions will often file "blocking charges" (which are Unfair Labor Practice charges) with the NLRB to "block" employees' attempt to have an election. Typically, unions will allege that the employer was somehow involved with the employees' effort. Even though this may not be true, the "blocking charge" serves to delay the process for long period of time while the NLRB investigates. 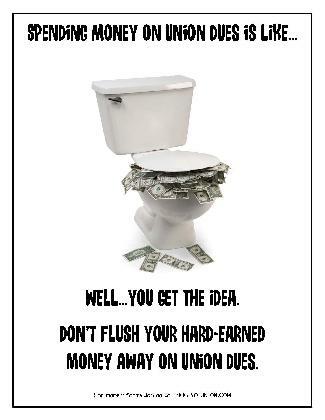 In the meantime, the union has the time to try and wear the employees down. Union Scare Tactics � Unions will often try to scare employees into keeping the union by stating that they will "lose" if they kick the union out, or that the Company will fire them without the union. These are desperate tactics and most employees will see through them as long as they are prepared. Promises to do "better" � When scare tactics don't work, unions will resort to trying to promise employees the union will do better. Union Bosses' Suddenly Get Interested � Even though you may not have been too important to the union bosses before, you may become real popular with them once you attempt to kick them out. On Election Day, the NLRB will conduct the election. Each party (the union, the petitioner, and the Company) is allowed to have an observer to ensure the election is conducted properly. These observers are typically co-workers. As NLRB election is a secret-ballot election. This means that no one will know how individual voters vote unless those voters tell others themselves. In the voting area, the NLRB agent will ask the individual voter his or her name. The observers will then check the voter's name off on the voting eligibility list. The NLRB agent will then provide the voter a ballot. The voter should then take the ballot to the NLRB's designated ballot booth and mark the box of his/her choice. The voter should NOT put his or her name on the ballot or any other identifying mark. The only mark that should go on the ballot is an 'X' in the box of his or her choice. DO YOU WISH TO BE REPRESENTED FOR THE PURPOSE OF COLLECTIVE BARGAINING BY: (Union Name) ? If 50% or more of the eligible voters (who actually vote) cast a "NO" vote, then the union will be decertified. FOR INFORMATION ON HOW TO HAVE YOUR EMPLOYER WITHDRAW RECOGNITION OF THE UNION, GO HERE.